Launched in 2010, Instagram is a free photo and video sharing platform that was initially offered only on iOS. However, in a few short years, it became a staple of social media, with Facebook scooping it up for $1 billion in 2012. One of the biggest recent changes for the platform was ditching app-exclusivity, giving users the option to access their accounts online. Additionally, the social network made smart choices by moving from a chronological feed to an algorithmic feed, allowing some variability in photo and video size, crushing it with Instagram Stories, and introducing influencer marketing. This slew of changes, among many more, all contributed to Instagram users crossing the 1 billion per month mark this year. Of course, that’s not where the mind-blowing Instagram stats and facts end… Oh no, we’re just getting started. From the first European arriving in the Americas to the first man on the moon, whoever gets there first is bound to go down in history. So, who was the first person to post an Instagram photo? Instagram co-founder Mike Krieger cheated the rest of the world out of the opportunity posting the first Instagram photo on July 17, 2010—way before the app launched. Within 2 months of being open to the public, Instagram stats were pointing the platform toward the big leagues as it tipped the scales with 1 million Instagram users. It hit 10 million users a year later. Six days before Facebook bought Instagram for $1 billion (April 9, 2012), the platform became available for Android. In November of that year, Instagram users were able to take advantage of web profiles. Then, in February 2013, the company rolled out its web feed, along with celebrating 100 million Instagram users. Instagram introduced videos in June 2013, rolling out direct messaging in December that year. With a huge user base, Instagram moved to further monetizing its assets and pushing Instagram growth by introducing advertising for select brands in October 2013, making it available to everyone else in September 2015. Then, a month before the platform followed Facebook’s lead and switched from a chronological feed to algorithmic feed in June 2016, it rebranded by changing its logo. Instagram rounded out 2016 with a sucker punch at Snapchat, stepping into the ring with Instagram Stories, its version of Snapchat’s ephemeral content that only lasts 24 hours. Nearly one in three internet users are Instagram users. Hitting the mark of 1 billion monthly active users in 2018, Instagram is now the fastest growing social network at 5% growth per quarter—significantly ahead of Facebook (3.14%, and Snapchat (2.13%). According to a 2018 Social Media Use study conducted by Pew Research, 35% of adults say that they use Instagram, up from 28% in 2016. 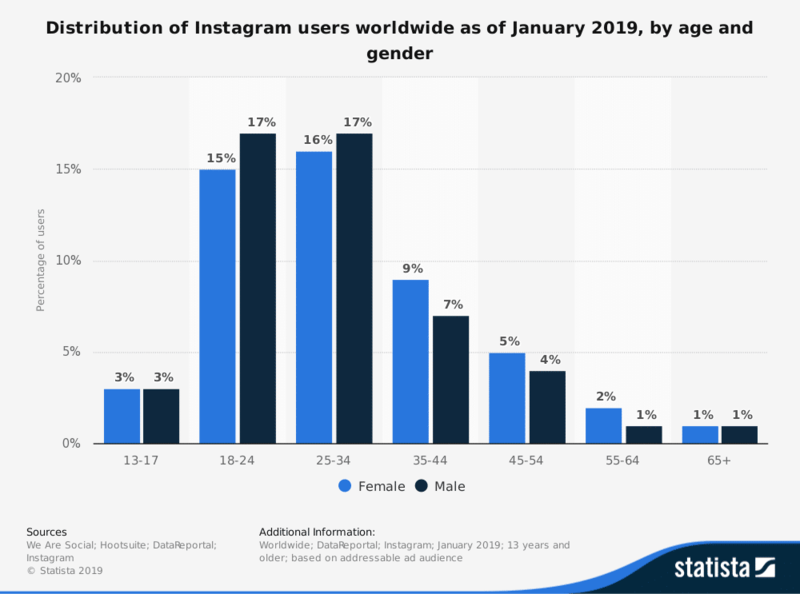 In fact, the site is dominated by 18- to 34-year-olds, which isn’t a huge surprise as Instagram is predominantly associated with millennials, with the 18- to 24-year-old age group comprising 32% of Instagram users. Americans in this age group actually bolster the numbers with a Pew Research study revealing that 71% of Americans 18- to 24-years-old use Instagram. An interesting Instagram statistic that throws most people for a loop is the fact that despite the proliferation of the social media platform among Americans, 80% of Instagram users are not from the US. However, no matter where people are coming from, Instagram users are addicted to the platform and becoming even more so. According to a Pew Research study, 60% of Instagram users visit the site daily, up from 51% in 2016. On average, users will spend anywhere between 24 and 32 minutes scrolling through the app or posting content each day. According to Instagram, more than 40 billion photos have been posted on the social network, with more than 95 million additional photos posted per day. Of course, the big numbers don’t stop with posts: Instagram users also dish out about 3.5 billion shares and likes per day—double tap to fill in the heart for that Instagram stat! In fact, Instagram stats reveal that it is the social network wielding the most engaged users. 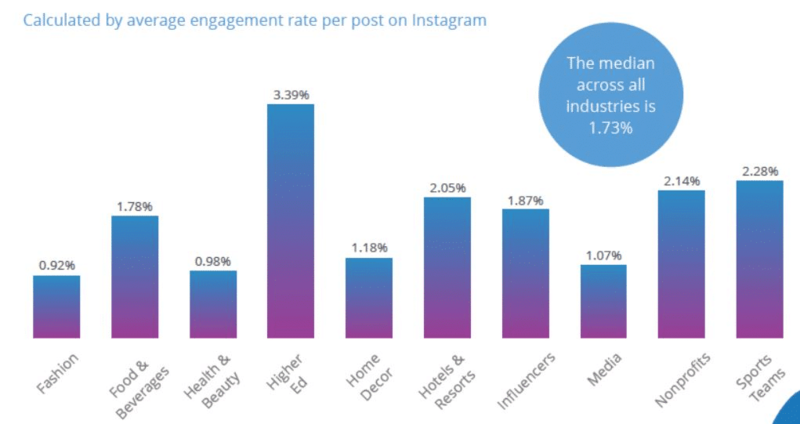 Engagement rates for Instagram range from 2-7%. That might seem low until you realize that Facebook’s engagement rates range between 0.10%-1.5%, and Twitter’s is even lower than that. 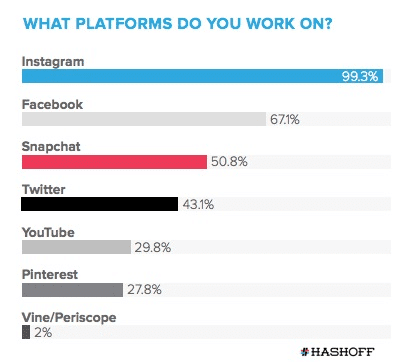 When it comes to content production and engagement, Instagram is going the same direction as the rest of the internet. Though photos were top dog when it came to garner the most engagement—36% more engagement than video in 2015—videos are slowly starting to take over. Other ways for Instagram users to rack up engagement is including another Instagram user’s handle in a post, which increase engagement by 5%. 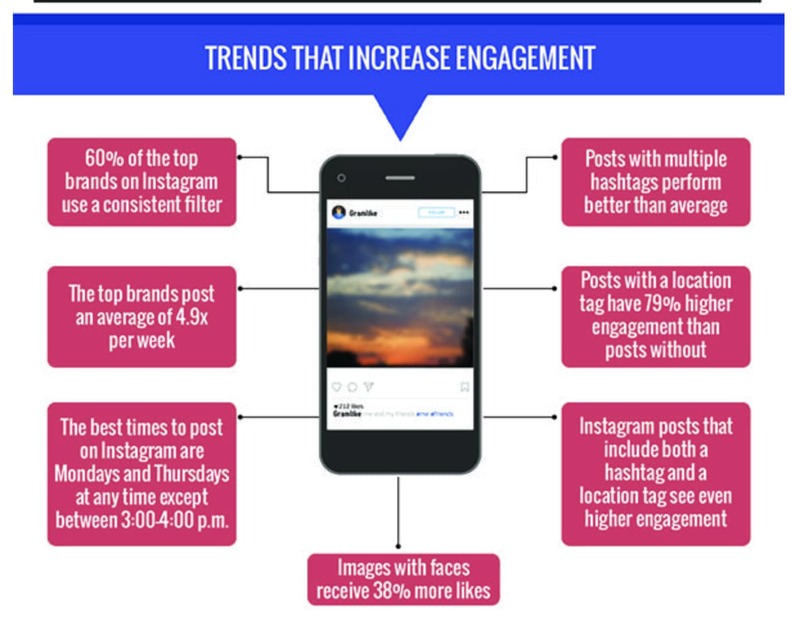 However, for Instagram users looking to get a bigger boost in engagement, including at least one hashtag on average will see a 12.6% rise in engagement and tagging a location will see engagement skyrocket by 79%. Additionally, putting faces in posted content is a great way to see the number of likes for the post increase by about 38%. What’s truly mind-blowing is that despite having the highest engagement rate among all social networks, Instagram’s new algorithmic system means that about 70% of posts do not get seen at all. This means that 30% of the 95 million photos posted each day are getting an extraordinary amount of traction with a highly-engaged user base. 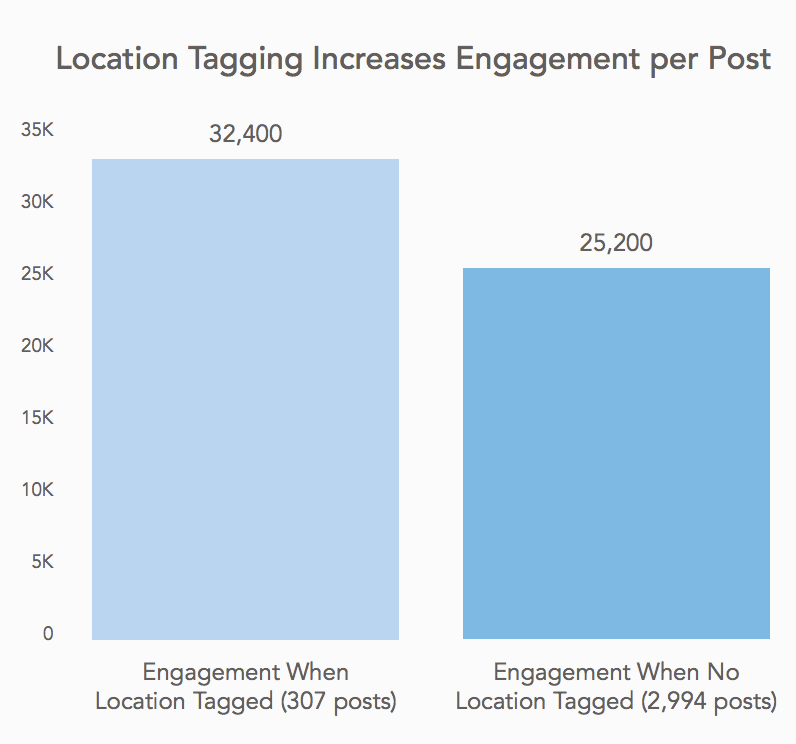 A big reason many marketers, influencers, and brands dig into their Instagram statistics is to figure out when to post content. Unmetric had the same question. It conducted a study of more 100 US brands, discovering that the best days for posting to get the most engagement were Tuesdays and Thursdays. 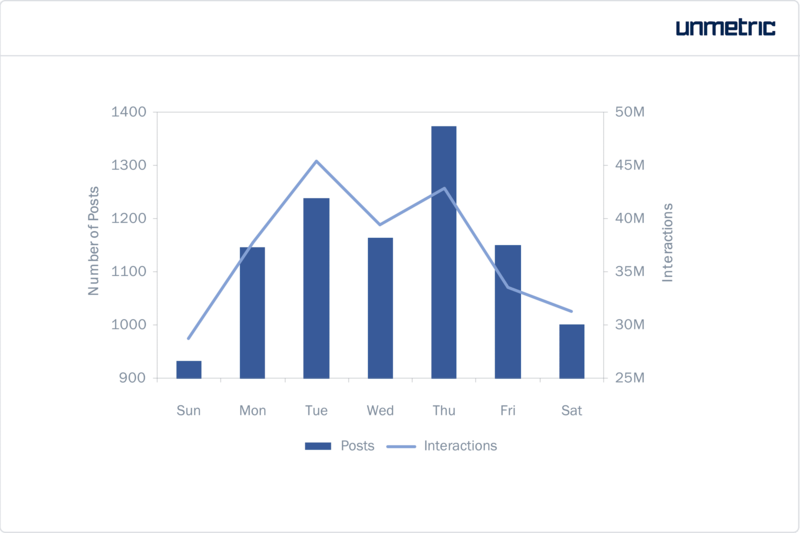 They also found that the average number of interactions per post was uniform overall, even though brands post less during Sundays and Wednesdays. Because people on Instagram are gene (UGC). From ridiculous candid moments caught on camera to epic professional drone footage, UGC dominates. In fact, nearly half of the top content marketing leaders rely on UGC. UGC also impacts conversion rates in industries such as fashion, jewelry, footwear, beauty, and consumer electronics. Based on projections from the International Data Corporation, there will be more consumer-generated content than marketer-created content by 2020. When Instagram introduced videos, 5 million videos were shared within the first 24 hours. That’s more than 208,000 videos per hour. And though, for a while, photos continued to garnering more engagement than videos—that’s no longer the case. Responding to Instagram user’s excitement about videos, the social media giant has not let up. Instagram now allows users to post videos in various formats: Live, Stories, Posts, and Ads. 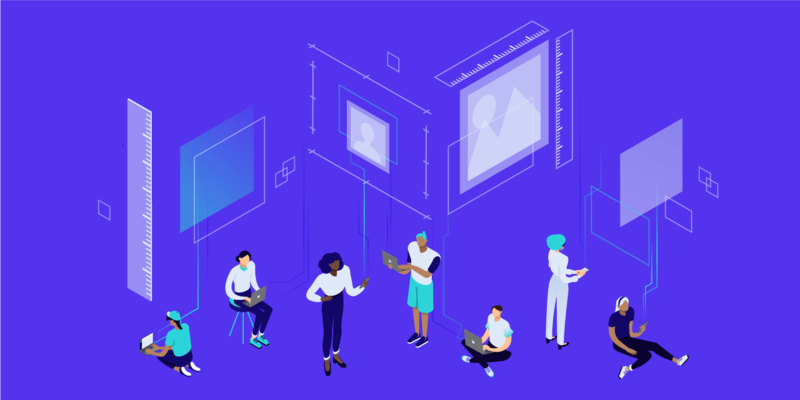 Additionally, Instagram recently introduced video chat through its direct messaging feature, as well as IGTV, which allows users to post longer videos—opening the doors to even more creative ways for Instagram users to create engaging content. Snapchat might have popularized the ephemeral social media game, but it’s losing its place as king of the hill. 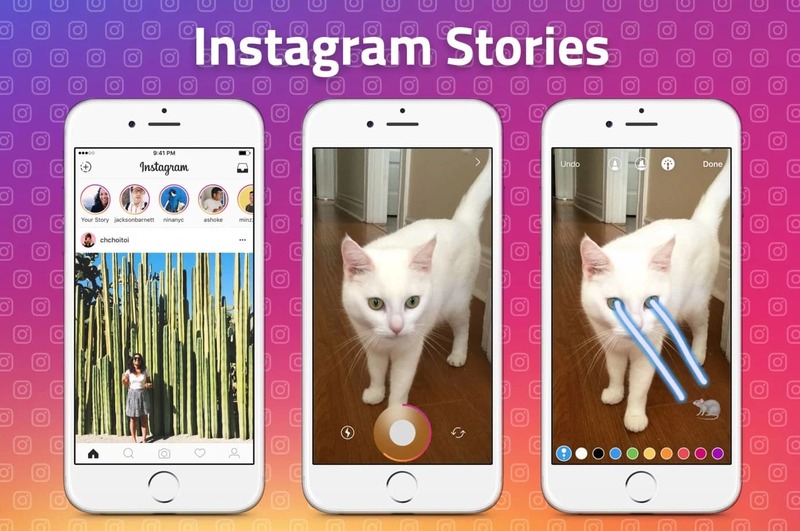 With Instagram Stories being used by more than 400 million people daily, the number of Instagram Stories daily active users (DAU) has overtaken Snapchat. Instagram statistics reveal that brands certainly prefer Instagram Stories to Snapchat, as they post twice as much on Instagram Stories. The popularity of Instagram Stories with brands is most likely connected to the “Swipe Up” feature, which allows users with more than 10,000 followers to post an external link, thus improving click-through rates and conversion rates. A recent bonus feature for those who love Instagram Stories is music. The new feature allows Instagram users to record Stories with music from Instagram’s in-house library. Though only available in select countries, it is expected to be rolled out elsewhere soon. As if music and the Swipe Up feature weren’t enough for most marketers and influencers, Instagram also allows users to shop via Instagram Stories! 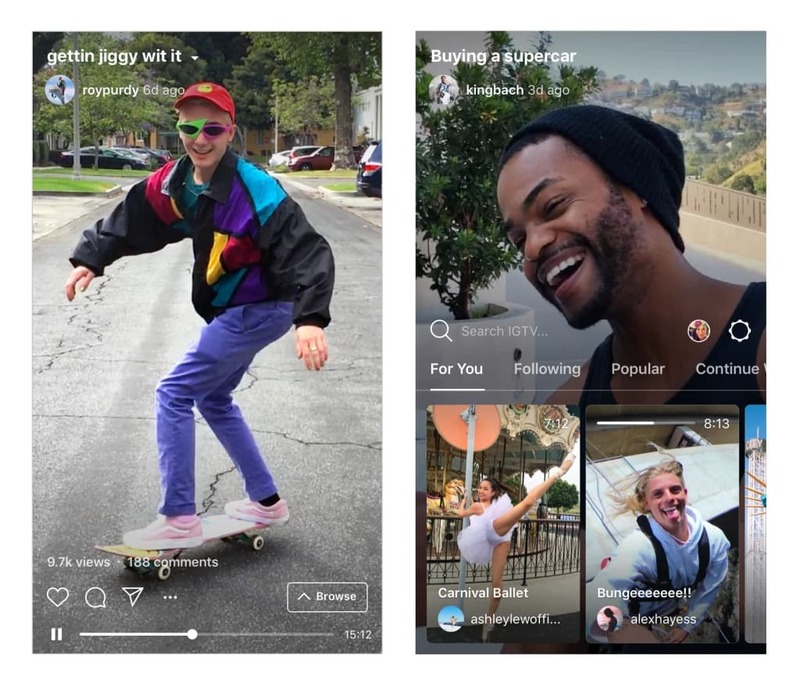 The two most important features Instagram has released recently are IGTV and the video chat. Ever consider making a movie on the fly for Instagram? Then IGTV is exactly the feature you’ve been waiting for. IGTV allows users to upload vertical videos that are up to 10-minutes long for regular users and up to an hour long for users with more followers. Though IGTV is available through its own standalone app, you can watch IGTV posts on the Instagram app—this is basically Instagram’s response to YouTube. Of course, IGTV allows you to watch videos of people you already follow on Instagram. Additionally, you can search for users’ videos, which will be found on their IGTV channel. The video chat feature on Instagram Direct is also a serious expansion into an area of the internet with stiff competition—notably Facetime, Google Chat, and Facebook Messenger. However, this feature allows Instagram users to host a video chat with up to four friends at a time. Hashtags are an integral part of Instagram. They make content discoverable, which helps people find Instagram users with similar interests. 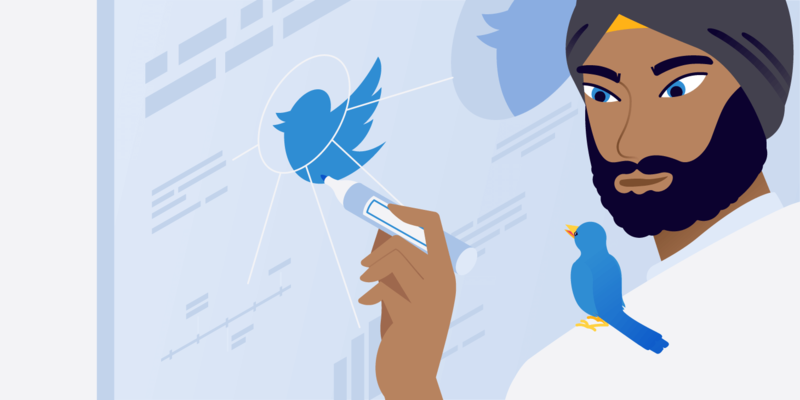 They are also used by brands and influencers to gauge how successful their social media marketing campaigns are, to gather information about how their brand is perceived by users, and to chart how many people are talking about them on the platform. There are two types of hashtags used on Instagram: community and branded. Community hashtags are more general hashtags, such as #Love, #InstaFood, #ootd, #TBT, and so on. These are perhaps the hashtags that users are most familiar with. However, branded hashtags, which are designed for a specific brand to track their user-generated campaigns, dominate. In fact, 70% of hashtags are branded. One Instagram stat that marketers and influencers pay particularly close attention to is how many hashtags they include in a post. Though Instagram users are allowed to add up to 30 hashtags, it might not be the best idea to do so. As it would turn out, the optimum number of hashtags is 11. According to Instagram, 80% of users follow at least one business on Instagram and, as of November 2017, there are 25 million active Instagram Business profiles. That represents an explosive increase from 15 million in July of that same year. 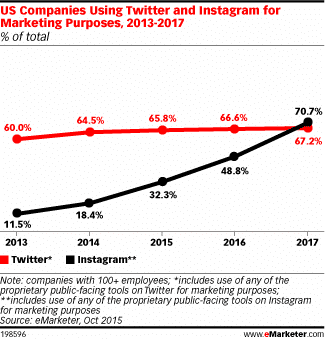 As of 2017, an estimated 71% of businesses are on Instagram, up from 48.8% in 2016. 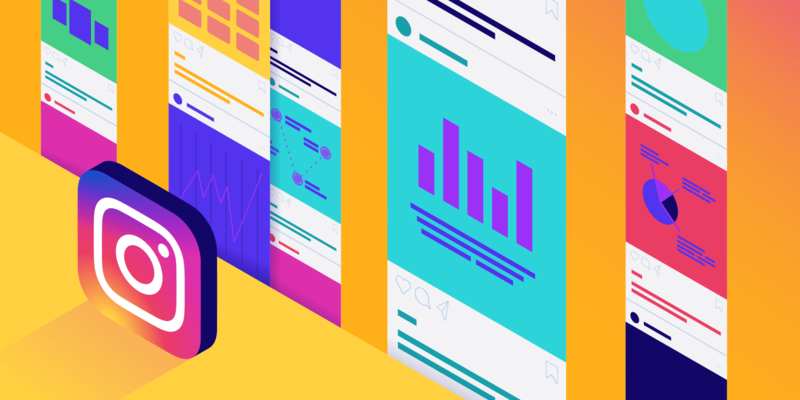 This explosive growth in business profiles could be attributed to the features only available to business profiles, such as being able to post contact information, as well as having access to Instagram advertising features and analytics tools. Businesses are investing time, money, and energy in Instagram for good reasons. As of March 2017, more than 120 million people messaged a business, visited a website, or called and received directions to a business through Instagram. Clearly, people are interested in engaging and utilizing Instagram as a resource for connecting with businesses. Additionally, the visual nature of the content posted on Instagram encourages users to shop. About 60% of Instagram users say they’ve discovered new products through the app, while 72% of users say they have purchased a product they saw on the app. In this way, Instagram is much like another popular visual social network, Pinterest, which is known for encouraging shopping behavior. Originally, Instagram’s limitations on the number of links that could be posted disrupted the shopping process via the app. Taking note of the issue, Instagram introduced the Shoppable Feed, which is available only to Business accounts. The shoppable feed allows brands to tag their products on Instagram posts. You’ll know posts are Instagram shoppable because there is a shopping bag icon on the top right corner of the post. When users tap the photo, they can see details about the product. Clicking on the details leads them to an external page where they can purchase the product—without leaving the app. Instagram is the most used social network by B2C influencers, with 92% of influencers saying it was their most focused-on social network in 2017. It turns out that Instagram is way out in front when it comes to what influencers like. 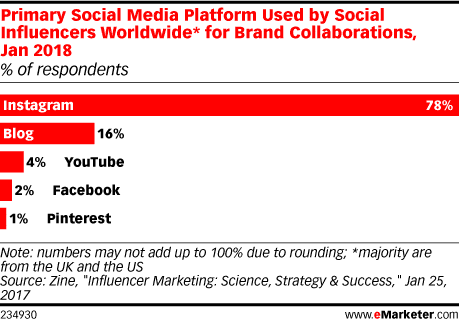 About 80% of them say Instagram is their platform of choice for brand collaborations. In second place, but still miles behind, is blogging, which sits at 16%. 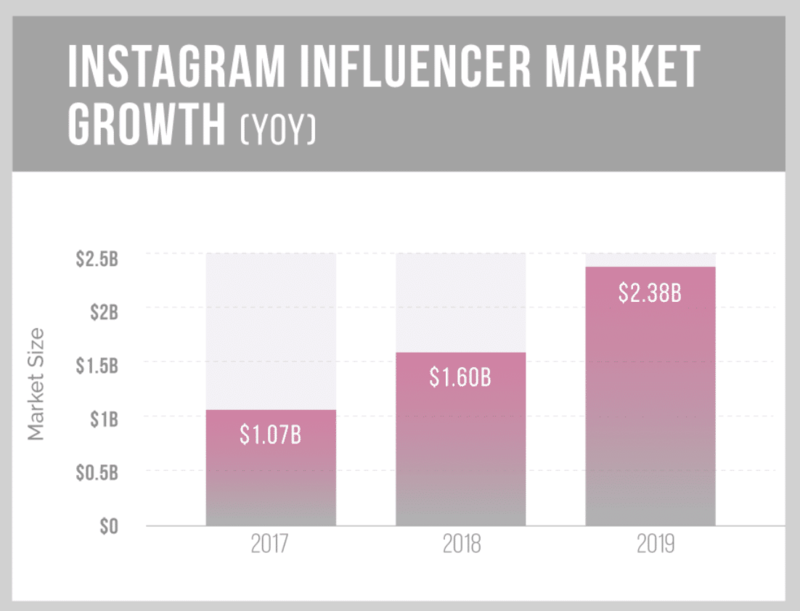 What’s a more mind-blowing Instagram stat than influence marketing on the platform being valued at $1.6 billion? The fact that this number is expected to double in 2019! That said, there are some pitfalls for brands and influencers marketing on Instagram. One study found that 8% of Instagram accounts are fake, with the same study finding that 29.9% of Instagram accounts are inactive. 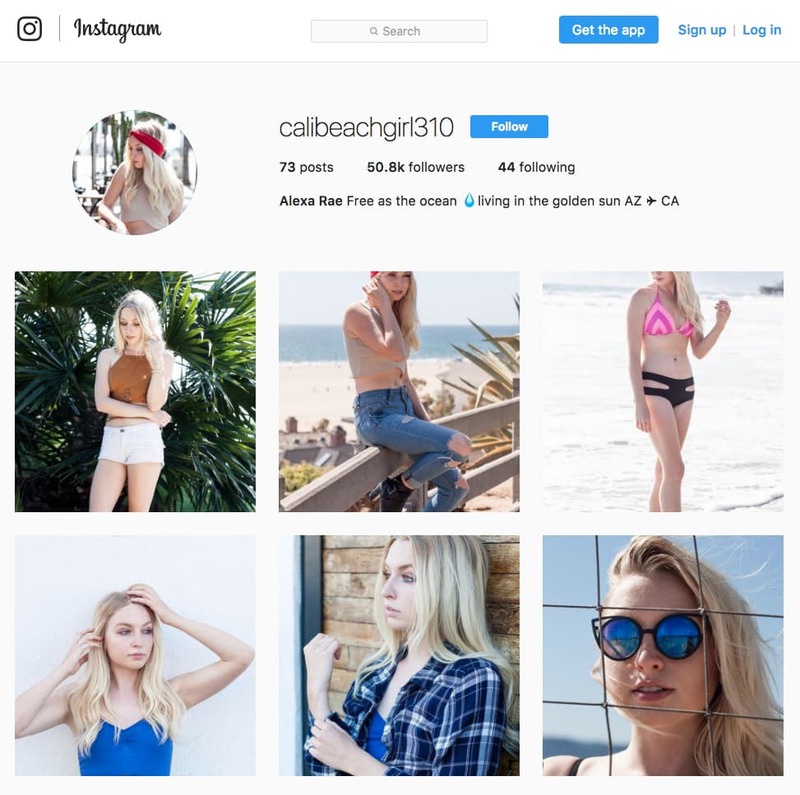 Mediakix conducted a test that consisted of creating two fake Instagram accounts with purchased followers. They were able to score four paid brand sponsorships—two each. Given that 70% of Instagram posts do not get seen, businesses invest in ads so that their posts will receive guaranteed views by targeted followers. There are more than 2 million advertisers on Instagram. Six months ago, there were only 1 million advertisers. With that many advertisers making use of the platform, it doesn’t take much of an investment from each of them for Instagram to be raking in big money. The platform expected to scoop up $4 billion in ad revenue in 2017, with estimates for 2019 climbing to $10 billion. Certain Instagram facts aren’t going to win anyone a chair at a board meeting, but they might come in handy on quiz night. So who has the most followers? What brand is crushing it? And, what photo is most liked? Also, what’s the most popular filter? The most followed person on Instagram is Selena Gomez (@selenagomez), with 138 million followers. Second place goes to soccer player Cristiano Ronaldo (@cristiano), with 133 million followers. Rounding out the top three is Ariana Grande (@arianagrande), with 123 million followers. Instagram itself crushes on its own platform when it comes to being the most followed brand, with 241 million followers. National Geographic (@natgeo) takes second place with a solid 89.1 million followers. The most liked photo is Kylie Jenner’s first photo of her daughter Stormi with 17.9 million likes, and counting. It’s not Juno, Reyes, Valencia, or Ludwig. The most popular Instagram filter according to Canva is Clarendon. 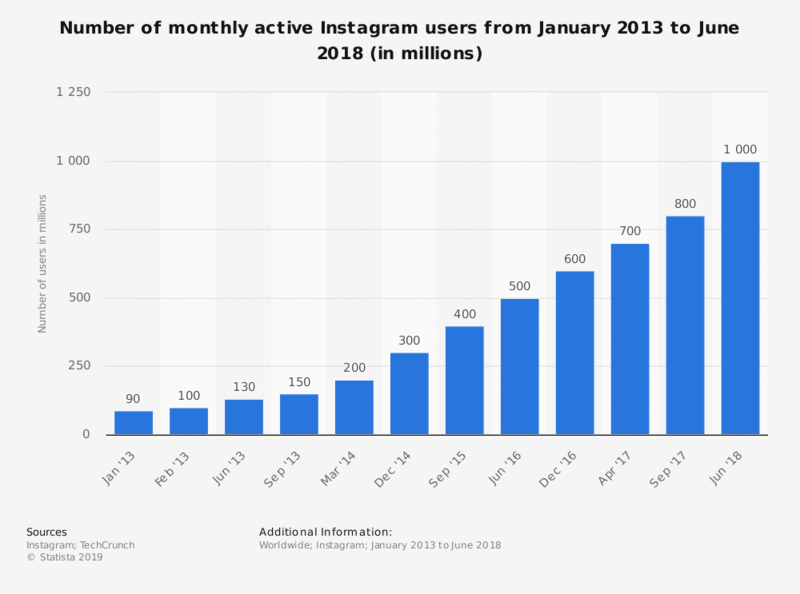 Instagram’s recent, explosive growth is a tribute to the platform’s adaptability, profitability, and general ability to engage with its more than 1 billion users. From the introduction of influencer marketing to its successful challenging of Snapchat, Instagram is clearly going to continue to dominate in the war among social media giants. Facebook has got to be happy with their acquisition of the platform for just $1 billion dollars—especially given that its projected to be pulling in $10 billion in ad revenue in 2019. With its current trajectory, without a doubt, Instagram statistics will keep making headlines. Didn’t see your favorite Instagram stat? Tell us about it in the comments below! Interesting post – thanks for sharing!